When it comes to the basic, biggest bang for your buck exercises--we love the push-up. After all, a true test of strength is how well we can maneuver our own body weight. If you’re new to fitness or just haven’t yet been able to cross off “doing a full push-up” from your fitness bucket list, it’s time to hone in! These FOUR modified push-up variations will help you work up to the real thing. It’s OK if you feel like you’re “not good” at push-ups! These modifications or regressions, which are slightly easier variations, exist to help you build the necessary muscles required to get you mastering a full push-up. Think of them as prerequisites. The push-up is a great way to improve upper body strength, specifically the chest (pectorals), back of the arms (triceps), and shoulders (deltoids). It also requires a ton of core strength to maintain proper alignment. These are the areas we need to focus on whipping into shape. Regardless of the type of push-up you’re doing, doing it properly is the most important thing. If you feel like the modified version that you are doing is still too challenging to keep your form, that’s a good cue that you may need to regress down a level. Alternately, if you can perform 8-10 reps with excellent form and control, its probably time to level up. Hands: Hands should be directly underneath the shoulders. How wide you choose to place your hands can vary. Different widths will target the muscles differently. General rule can be to start with slight wider than shoulder width. (A closer hand position will work more of the back of the arm or tricep and typically is more challenging.) Pointer fingers should be pointing forward. It’s also a good cue to think of screwing your hands into the floor away from you thumbs. This helps stabilize the shoulders. Head/ Neck: Gaze should be down, chin slightly tucked, so that we are keeping our head and neck in line with the rest of our spine. Shoulders: These should be down and back away from your ears. You want to be pushing up throw your shoulders and not sinking through the middle of your back. Hips/Core/Low Back: To keep it simple, you don’t want to be sagging through your mid section. This is an indication that your core is not active and hips maybe tilted anteriorly. On a proper pushup, the first thing to touch the ground would be your chest, not your hips. To accomplish this, think of tucking your “tucking your tall” to align hips properly. Feet: Feet width is personal preference. The closer together your feet are, the smaller your base which could potentially make the exercise more challenging. Start with your feet about hip width apart. Listed in order in which we would progress with clients (from less challenging to more challenging…). These are great if you are on the verge of being able to do a full push-up or you can do a couple and want to work on increasing your repetitions. Rather than focusing on the “push” you are focusing all of your effort on the eccentric or downward motion. Start in a high plank. Keep a nice flat, “Table-Top” back. Lower yourself down, slow and controlled, fighting the resistance of your body weight. Try to lower down for a 3 or 5 second count. Here is where you use your muscles! Head, chest, hips, and knees all come down in one straight line. With this variation, you might feel like you are “cheating” because you are only performing half of the range of motion, however, it will help train your core to maintain positioning throughout the range of motion. It will also help improve your tricep strength when locking out at the top. It is great way to improve your push-up confidence because it means that you are almost there! Overnight oats are a time efficient, well-balanced and delicious meal. What more can you ask for! The ability to comfortably, and without compensation, put your arms straight up over your head is lost for many people. This is because it is a position we rarely find ourselves in during our daily life. In a perfect world, we wouldn’t even have to discuss diaphragmatic breathing because it is a naturally occurring process that every human being does naturally. However, as we spend large amounts of time stressed and in active, the muscles in our core and diaphragm weaken and our breath becomes more and more shallow. This year, I had the privilege of attending The Arnold Sports Festival from March 1-3. This three-day event is held every year in Columbus, OH and hosted by the one and only, Arnold Schwarzenegger. 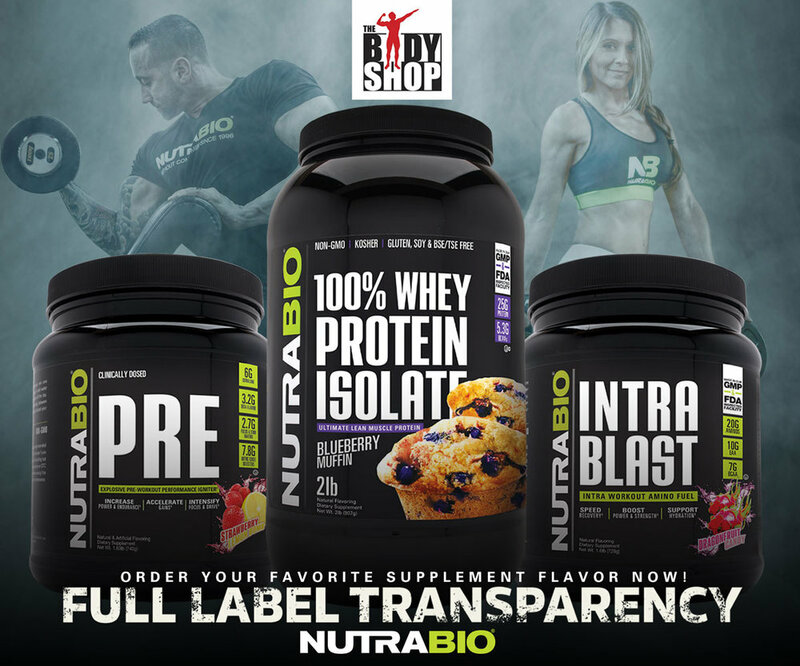 My role at the event was to work the Nutrabio booth, representing, promoting, and selling their products. While I’ve attended many events with Nutrabio over the last five years, the Arnold Sports Festival was by far the most electric. We all come in different shapes and sizes, and while much of that has to do with lifestyle and environmental factors, some of it boils down to the genetic “body type” we were born into. When it comes core/abdominal training, the plank is usually the go to choice for gym-goers and trainers. However, it is one of the most poorly performed exercises and most people don’t realize they are doing it incorrectly. However, There is a lot of really great ways to do planks and great ways to program them into your workouts. How Ultra-Processed is Your Diet? Every once in awhile, I’ll read a new nutrition study and think to myself, “Yea...no duh.” While this most recent study falls into that category, it serves as a great reminder that our nutritional choices do, in fact, become our biology. With increasingly evolving food technology, food choices and food categories have expanded, making it harder to make good choices. Not only do we have processed and unprocessed foods, but we now have the emergence of an entirely new category of “ultra-processed” foods. When it comes to factors that can limit your fitness routine, chronic back pain is high on the list for many. First and foremost, we highly recommend a doctor’s visit to address your back pain and immediately ditching the training motto, “no pain, no gain.” Trying to work through back pain without figuring out what the cause is and how to properly address it, can end in huge setbacks. Exercise Order: Are You Doing It Right? Jumping into your workout right from the car is never a good idea. The goal of your warm-up is just what it sounds like, to warm up the muscle. Most times when people say, “I’m not very flexible” in regards to not being able to touch their toes, inability to get into a proper deep squat or an overall feeling of stiffness throughout the day, in actuality, it is not really flexibility that is the issue. It would be wrong of us to completely ignore the marriage between fitness and New Year’s Resolutions by not mentioning the topic in a Facebook post, blog or instagram story. So here it is...our obligatory New Year’s Resolution post! The key is not just to live longer, the key is to live longer, while maintaining your quality of life. The more and more research that is done, the more clear it becomes that the key to successful longevity is movement. Movement is the key to maintaining activities that you love and our ability to care for yourself. Our bodies are not meant for stagnation. Although this is not your typical gym before and after photo, it serves as a huge reminder for us about the importance of maintaining adequate hydration. The first photo is our studio plant after three days of no water (oops!) and the second is the transformation it made in just three hours after watering! The truth is that an estimated 75% of us are walking around in a constant state of dehydration. When it comes to functionality, there is arguably no muscle group more important than your grip. The word “functional” is often overused in fitness, but in this case it is necessary. If your grip is weak, you’ll need help doing everyday tasks like opening a jar or carrying groceries to and from the car. In my experience, there seems to be one behavior characteristic that our most successful clients have in common. It’s one that is not talked about enough, probably because it can’t be marketed and sold. However, if you can nail this one down, you can almost bet on success. The behavior is the ability to remain consistent.